My very first time… with… Spam! – CHUBIBO! My very first time… with… Spam! 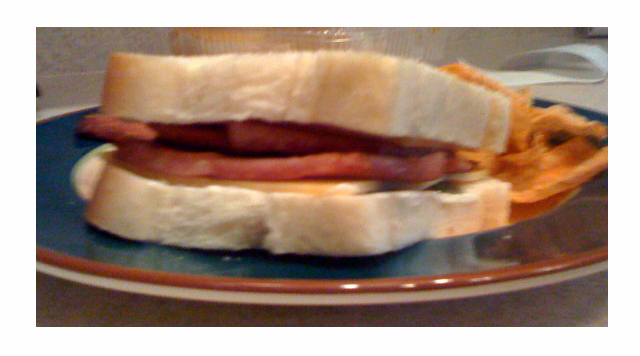 Our cook had high fever this morning but got out of bed to make me a Spam sandwich for breakfast. The sandwich jerked open a floodgate of memories. Most especially my first time to taste this reliable comfort treat. I remember it quite well. My mom had just given birth to my baby sis (Gina) at Clinica Lopez on Pennsylvania St. (now Leon Guinto). My brother Greg was tasked to buy food for me and my siblings at the corner Chinese resto/sari-sari store (on Herran). He came back with sandwiches that emitted a most alluring scent that permeated the whole hospital room. When I bit into my breakfast, it was sheer heaven… a taste so different from any other food that I had tried in my (then) eight years of existence on earth. And that was my most unforgettable intro to good, old Spam. It was truly a special day. Spam fried crispy with finaden’ne (Guam staple dipping sauce of labuyo peppers, onions, soy sauce and kalamasi or lemon juice) and hot rice. That’s what I’m talkin’ ’bout! i forgot to mention also that guam consumes the most Spam in the world – relative to population. Hmmm…I can relate to your spam experience. I like it on hot pandesal with mayo. Hi, I googled Clinica Lopez and got your blog. I was born in Clinica Lopez in 1951 and Dr. Jesus Lopez delivered me. Would you be able to share any info about the hospital such as how big it was and when it closed? There’s nothing about it on the Internet. Thanks. it was clinica Loez, then the name was changed to clinica de la rosa. it wasn’t really big but it sure was clean.i’d guess that the size of the property was less than 1000 sq meters. one storey hosptal. couple of blocks away on pennsylvania also was the orig Maryknoll college. remember bro at that time almost everything was imported. so you had an imported spam! another thing that i loved was the matamis na saging saba with shaved ice. the hospital probably closed in the mid 60s probably.